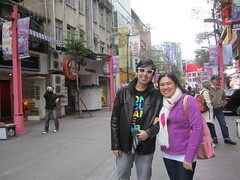 I spent two days in Taipei with my friends Rach and Yummy Friend (YF). We got cheap tickets for approximately P3,720 per person from Cebu Pacific. The flight times were all in the middle of the night. If you’re in for slightly less expensive travel, it’s acceptable. 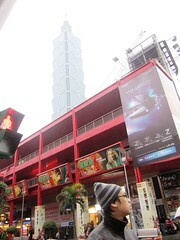 We stayed in Rainbow Hotel at the Ximen area of Taipei. Rach recommended it having been to Taiwan six times before this trip. I like the location being in the middle of many shops and bargain finds and it’s a short walk to the train station, too. This is Rainbow Hotel, the place where we stayed. Photo credit goes to the Rainbow Hotel website. The arrangement we had with the hotel did not provide airport transfers* so we took the airport cab to Ximen. It’s around 30 to 45 minutes to get there, depending on traffic. Taipei is much like Manila, although it’s cleaner and the roads are definitely better. Anyway, we paid NT$1,200. It must be a fixed airport rate because if you opt to compute it, you have to add 50% on top of the meter fare plus the toll fee, which you wouldn’t know how much, as the cab was equipped with an e-pass that just beeps when the car passes by the toll booth. Anyway, it must be around the same or a little higher than the actual fare, but at 1 am, who has the energy to compute? We checked in and settled a little after 2 am. 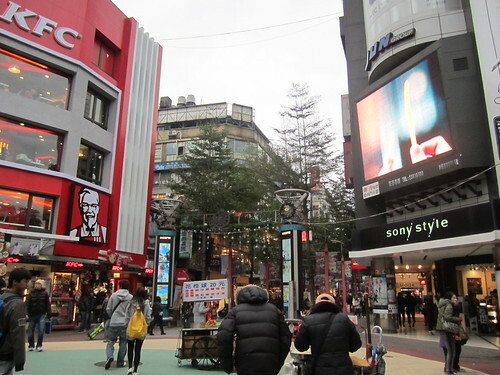 The hotel arrangement did not have free breakfast, too*, so after we freshened up at 10 am, we went down and started exploring Ximending at 8°C! It’s a little cold for our tropical country-born bodies. 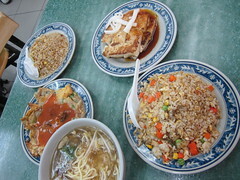 🙂 We chose a carinderia-type eatery named 365 where we ordered chicken noodles, seafood noodles, oyster cake, radish cake and two kinds of fried rice. The food’s great. I have to single out the sauce used in the radish cake; it’s just tops! The total bill for our breakfast was NT$290. Not bad! After eating, we walked around. Taipei stores open at 12 in the afternoon. Some open at 11 am and these shops are few enough, you’re bound to miss a lot when you try to do your shopping at this time. We entered Eslite, a small mall which has a Muji inside. The Muji branch was as big as the one in Rockwell but the items are way, way better. For one, their food shelves are so extensive! We went back to our hotel room a little after 1 pm. Because I was really cold, I bought a cup of hot chocolate from 7-Eleven and it was so good. An inch more and it’s expensive coffeeshop-quality already, which was a timely comparison since the 7-Eleven I bought it from was beside a Starbucks. A medium-sized steaming hot chocolate was only NT$40. Aside from hot chocolate, I also bought 7-Eleven chips which were not sold here in Manila. For NT$17 each, I bought decent tasting potato chips in different flavors. 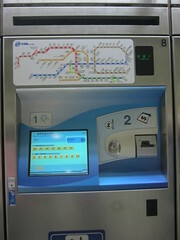 It's about time we switch to this kind of token technology in our MRT/LRT. I just feel bad for the token booth tellers who will be displaced. 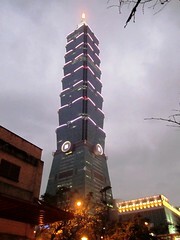 We took the blue line of their MRT to the Taipei City Hall station which was the closest if you’re going to Taipei 101. 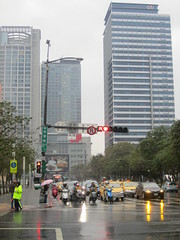 The station was near 101 but since it was raining and we didn’t have an umbrella, we just took a cab for a short drive. We reached Taipei 101 Mall and window shopped. Most of the shops were high end so we decided to go to New York New York mall as it said on the map. Almost an hour of walking under the 7°C weather, and in the rain at that, we settled in a small mall named Neo 19 and ate at Chili’s 🙂 We were tired and hungry from all the walking so we aimed for something we’re already familiar with. After we took shots with a good view of Taipei 101 behind Neo 19, we discovered that New York New York was closed for renovation. It must be why we couldn’t find it despite following the map to the letter and asking two different traffic enforcers! We decided to walk back to 101 to see if we can buy anything (I mean, we got to at least buy something!). We went to Page One and in the end, Rach bought a CD by Lee Hom, and I, my customary book souvenir (I picked Jodi Picoult’s newest novel, House Rules) and two rolls of clear tape with matryoshka dolls design. We did not go to the 101 observatory because it’s pricey for a view of a foggy city. Note that it’s raining almost the whole day and the sky was really gloomy. It wouldn’t be worth it. Maybe some other time. To go back to the Taipei City Hall station, we luckily chanced on a free shuttle that takes people from 101 to there. It was so fun that as soon as YF stepped inside, the bus door closed and the bus went as strictly scheduled. When we got to the station, we decided to check out the newly-opened Uniqlo branch before heading back to Ximen. Rach said it must have opened last year because it wasn’t there yet when she went in ’99. The store is inside Uni-Hankyu Department Store which is connected to the MRT station, but it has a separate entrance and the the area was cordoned off. The prices were reasonable for its brand and quality and we ended up buying plain colored undershirts for NT$199 each. We returned to our hotel to drop off some stuff. 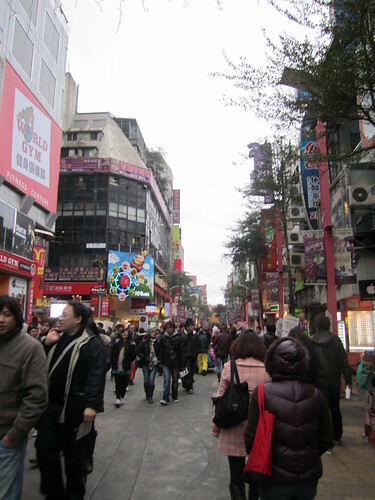 Since it’s been raining almost the entire afternoon, Ximen wasn’t as packed as it normally was. Plus, a police car was roving regularly and Rach said street vendors avoid it like the plague. So it’s like the situation in Divisoria and Tutuban, ‘no? Good thing we took our chances around 10 pm because some of them did get back on the streets of Ximen to sell their stuff at that hour – well, the rain stopped and the policeman must have gotten home. We bought local products for pasalubong to our family and friends – yes, we also had convinced YF to buy as well, he didn’t really want to – and ate some more. Rach and I loved the grilled mini-sausages for NT$50 and YF and I absolutely loved the caramelized strawberries on stick! The hardened caramel was so easy to crack and it melts in your mouth, and the strawberry was soft and juicy. It was so worth its NT$40 price. We retired close to midnight. The hotel has a decent hot/cold shower which is always a barometer of a good hotel for me. Utilizing it was a great way to cap our very tiring day. * We paid for a triple-sharing room only. We were charged P8,940 in total for two nights of stay. Part 2 will be posted this weekend. teka, sino yun kasama mong pogi? actually napansin ko din yan, ang haba nga! kaya yung part 2, ibu-bullets at pictures ko na lang.